There is some tall grass with a few wild Pokémon. Wingull also appears on this route. Be careful if you chose Torchic as it's Water Gun attack is super-effective. At the end of the route will be May / Brendan. Talking to him or her will initiate your first battle. For now, your rival will only have one Pokémon; what species it is depends on which Pokémon you chose from Birch's bag. Like past games, your rival will have the Pokémon with a type advantage against yours. Since both Pokémon are still low-leveled, neither knows an attack of their own type yet, so your rival doesn't have much of an advantage just yet. Techniques like Growl, Tail Whip and Leer, can be useful if used one or two times. Also, if your Pokemon are low on health, use a potion that you received from the man in Odale. After you win, (s)he'll leave, and tell you to come back to the lab. 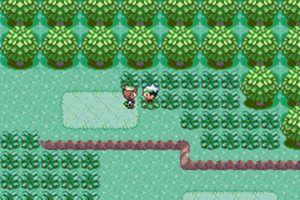 You'll have to walk back to Littleroot Town, but this time you can avoid the tall grass by jumping over the ledges. Once you get back to Prof. Birch's lab, he'll give you the Pokédex, and your rival will give you five Poké Balls. You can then leave for Petalburg City. Before you go, your mom walks out of your house and gives you the Running Shoes. She reads the instructions (hold down while you're walking) and lets you go on. When you go back to Oldale Town, the man blocking Route 102 will be gone, allowing you to get to Petalburg City. This seagull of sorts is not very rare over ocean; once you hit the high seas, you'll be running into swarms of them, and their evolved form Pelipper, so don't fret if you can't get one now. If you want one now however, it might take a while, since they're a bit rare on land. Overall, their stats aren't too exciting, but he possesses Water Gun a basic water move, making him useful for players who didn't choose Mudkip as their starter, especially for Torchic users, who would lack an advantage at the first gym. Overall, with Wing Attack available after a few levels of training, he makes a useful member to your team for the early part of the game. There's a bunch of trainers to battle here as well as some goodies. Use Cut to access the upper portion of the route where you can find 4 Cheri Berries and 2 Leppa Berries, a Guard Spec., a PP Up (Emerald only) and two trainers (Emerald only). Route 103 serves as a shortcut between Oldale Town and Slateport City, but the middle portion is separated by a large body of water. Since you don't have a way of crossing the water yet, this shortcut is currently useless to you. This page was last edited on 24 November 2018, at 01:46. This page has been accessed 118,991 times.